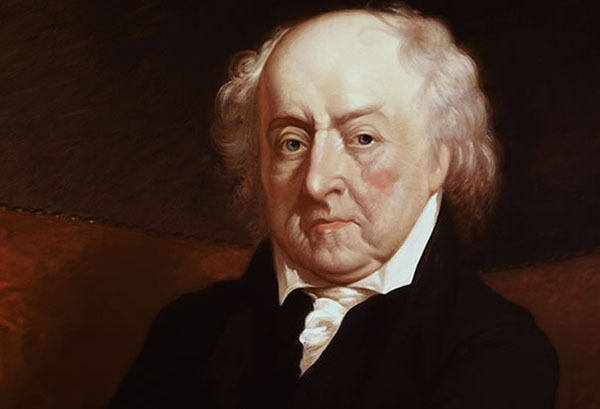 As the second President of the United States, John Adams, worked to further protect and define the fledgling nation. Not surprisingly Adams faced myriad domestic and foreign problems during his tenure. The French and English had been acting against American shipping interests impressing sailors and seizing cargos. To solve the dilemma the Jay treaty was signed with Great Britain but left the French frustrated. They responded to the new agreement, with a quasi-war on the seas. War fever ran high but Adams hesitated to lead the country into a conflict they were ill prepared for. The Adams administration sought to suppress dissent at home by passing the Alien and Sedition Acts. Passed in 1798 the acts flew in the face of the Bill of Rights, flagrantly ignoring the first amendment. Comprising four acts they concentrated on foreign influence in the country and the use of speech and press to convey opposing opinions. The Naturalization Act increased the years needed to become a naturalized citizen from five to fourteen years. This effectively eliminated newer immigrants from voting in any of the upcoming elections and protected the Federalist controlled Congress and executive office from possible French voters who sided with the Jefferson Republicans. The Alien Enemies and Alien Acts focused on the actual presence of recent immigrants. The enemies act gave the president executive power to expel foreigners he judged as dangerous during a time of war. The Alien Act allowed for the removal of any aliens “dangerous to the peace and safety” of the country or those involved in “treasonable” activities. Both measures were successful in frightening many new French arrivals out of the country who were concerned about the new acts. Perhaps the most egregious of the four was the Sedition Act. The act focused its attention on the Republican newspaper editors and those outspoken opponents to the policies of the Adams administration. Heavy fines (not to exceed $5000) and imprisonment (between 6 months and 5 years) were used to punish anyone found guilty of writing, speaking, or publishing “that of a false, scandalous and malicious nature” against the government or an official. Under the act twenty five were arrested, ten of those convicted and imprisoned. All were Republicans tried by Federalist judges and juries. The most visible of those found guilty was Mathew Lyon a Democratic Republican of Vermont. He was convicted in 1798 of publishing “libelous statements” but was still able to run a successful campaign for reelection from jail. The four acts were seen by many as a despotic abuse of power that was dangerous to liberty. Thomas Jefferson and James Madison responded to the acts with the scathing Kentucky and Virginia resolutions where they argued that the new country was a compact among states. This compact functioned until there was cause to reexamine the ties that bound them together. Though they proclaimed their attachment to the union of the states there was concern about the direction the nation was heading. Though short lived (one act was repealed in 1802 the others expired after two years) the acts tested the strength of the nation and opened the door for discussion about the possibility of secession. Commager, Henry Steele. Documents of American History. New York: F.S. Crofts & Co., 1946. Johnson, Thomas H. The Oxford Companion to American History. New York: Oxford University Press, 1966.